Invitation for everyone to join a SWAP! That means ALL of you are invited--even you who just read the posts and don't comment--you know who you are!! This is and ATC, or Artist Trading Card, swap. 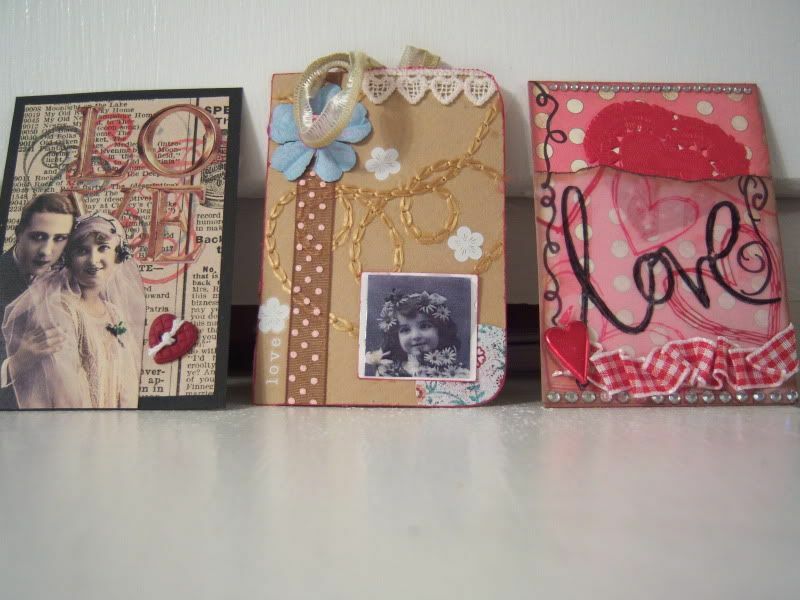 ATCs are 2 1/2 by 3 1/2 inch pieces of artwork (the same size as a baseball card), usually collage/mixed media--you can use any media you like, but the base should be fairly sturdy, like a decent weight cardstock. These are neat to keep as they are, but they also make great scrapbooking embellishments. We'll swap 3 for 3--you send in three cards, and you will receive three cards in return, form three different people. It's fine if your cards are all the same design. Please sign and date your cards on the back, maybe put your forum name, e-mail addy or blog, so the recipient can contact you and say "thanks." Please send in your best work--something you'd be delighted to receive in return. Please SEND BY FEBRUARY 2nd. That should give it time to get here--I'm in Missouri, so kind of central to most of you USAers--and back to you in time for Valentine's Day. These are tiny, remember? You can definitely have these done by then! Questions? Please ask! I probably forgot something . . .
right, yes, please post here if you're planning on joining in! I would love to play along! How fun! Okay, there's still plenty of time to join us--we have some ladies from an altered art group I'm in joining us, too. I'm already behind on my last swap...but next time I'm in. 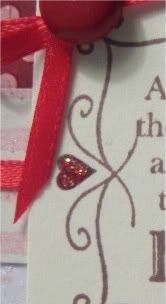 Ok, question: you just decorate a 2.5x3.5 piece of good weight cardstock in a love theme? That sounds like fun! If it's not too late, I'd like to join! Let me know! Nope, not too late, Janice! not a huge swap, but definitely "enough." trisha...you going to list who's in the swap so we know? just asking. Well I hope you're having fun with your atcs--how old are your boys, Janice? It was fun! Only a few, um.. interferences... I think at one point I was working on the cards with my 3 yr old on the back of my chair playing with a pop dot! Trisha, my boys are 3 (just turned 3 this past Tues.) and 18 mo. They are awesome! Ok, let me know if I can post a pic of my ATC cards for the swap! Since it don't know I'll just show you a small part of it! janice i am sure your cards are precious! i have got to do mine today! I'm doing mine today, too. Love what I see already, Janice. Janice's cards are adorable--I went and looked, of course! starting to get that "wanna play with babies" thing going again. Not birth them or raise them, just play with them. styles and takes on a theme. I just thought of a question: since we are just making three and there are more than three ladies participating, will we just be getting a random selection of three cards or just be swapping another participants three? Does that make sense? You'll receive three cards from three random people, but if you all want, I can keep the SGAs together, so you'll get back cards from people you "know." Whatever you prefer, it's up to you all--let me know what you think. I guess it would be nice to get someone's from this board! Whatever works best though will be fine with me! Mine are going out today! i'll take whatever is nice...hehe. Hey, Tina, are you still in? Let me know--I don't want to swap out if yours are en route. Hey! I just go mine in the mail today! What a GREAT surprise!!! Fabulous ATCs ladies!! I love how you put them in plastic sleeves Trish, thanks! They are all awesome and way cute!! I want to keep them, not give them away!! Ha! I will post a pick of the ones I got in a wee bit! Thank you for letting me know they arrived, Janice--I'm glad you like them. At this point, I can't remember who got what atcs. Usually there's a buncha chunky ones, with heavy embellishments, but this time around, I think Lora got the prize for the thickest cards, and hers actually weren't too heavy. ANYWAY, thanks for playing, ladies! hey girls! got mine today...so happy to get mail! isn't that silly? but i do love mail. nothing like presents and letters....ahhhhh. thanks for those great cards. they were my very first ones EVER! Here's a pic of the cards I got, aren't they cute! It was so fun to get these! SWAPS are fun! Subject: Re: Invitation for everyone to join a SWAP!